All our themes is translation ready by default and comes with proper “.po” and “.mo” files. These file is located in “languages” folder of each theme. Go to /wp-content/themes/[theme name]/languages folder and open en_US.po file in Poedit. When you’re done go to File > Save as and save your translation in a *.po file as lang-code_country-code.po lang-code are found here and country-code are found here . For example, de_DE.po will be German translation .po file. A .mo file will be automatically created in /wp-content/themes/[theme name]/languages folder. After these steps simply go to your admin panel and navigate to Settings->General. Define that language from this dropdown list. 1. Navigate to wp-admin->Plugins->Add New. 2. Search of Loco Translate in plugin search box. 3. Install and active Loco Translate plugin. 6. Choose the desired Language from the Dropdown Menu and click on Start translating button. 7. Search and select the string text you want to translate in source text window. 8. 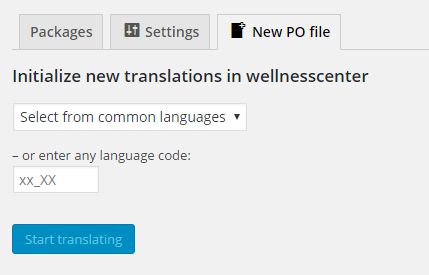 Add the translation in [desired-language] translation window. 9. Click on Save button when translation complete.